Since you now won't get around to use the Metro Start-screen on the recently released Windows 8 Consumer preview, it might be good to know how to add some functionality to it. 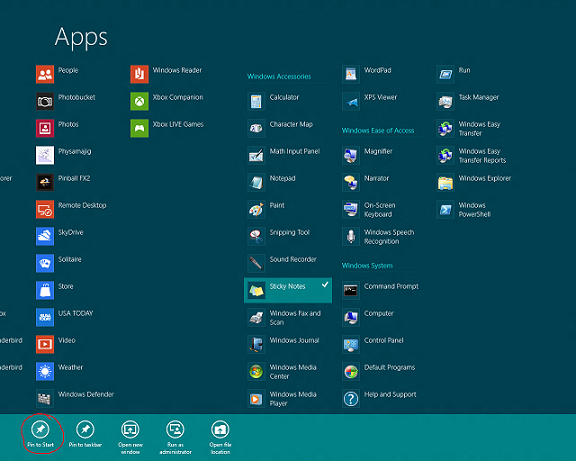 To pin other programs or folders to the Start-screen, go to the classic desktop and right-click the item you want to have on the Metro screen. Here, you also have the option to Pin to Start. A way to produce more customized tiles is to create a shortcut on the desktop which you can assign switches to. For example, if the shutdown button is too hidden for you, just create a new shortcut and assign the path shutdown /s to it (for more options, open a cmd and type shutdown /?). Stick it to Metro as described above, give it a nice icon before maybe, and your shutdown button will be far more accessible than the original one. How do I do this for a batch file. When I right click on the file, the Pin to Start does not appear in the context menu. You would need to make a shortcut to the batch file and put that in your start menu folder. The shortcut can be pinned to start even if the batch itself cannot. I made a shortcut and there’s no pin option – Whats the deal?